In 1989, about 250 MGVA Veterans and their loved ones visited the Nijmegen area during the 45th anniversary of Operation Market-Garden. The transport from Flushing to Nijmegen took place by train and the program that week was organized in co-operation with the city of Nijmegen, the Nijmegen tourist Centre and neighbouring towns. All guests were accommodated with host families and the main assembly point was next to the Nijmegen railway station where this photo was taken. The photo reads from left to right, Mr and Mrs Ray Picton, Mr and Mrs Ron Wingfield, Maud Sear, Afke and Maud Been and Dennis Sear. Saturday, 16th September 1989, 10.00 hrs. In the streets behind the Nijmegen Casino. Old "friends" meet again. I still remember the conversation which took place between Dennis Sear and his cousin John and the two American 505 PIR Veterans. 505 PIR : "How can you stand up straight with all these medals ?" Dennis : "We did have to earn them before we got them"
505 PIR : "Bla Bla Bla Bla Bla"
Dennis : "and eh .... what about the Ardennes ?" And then there was a strange silence, the discussion was closed. Only years later, during a vacation in the Ardennes and a visit to the Bastogne Historical Centre, I understood why, as it was here where the Americans took the greatest toll of human lives. Many British division was recalled to help the Americans out of their critical situation during "the Battle of the Bulge". Sunday, 17th September 1989, 15.30 hrs. 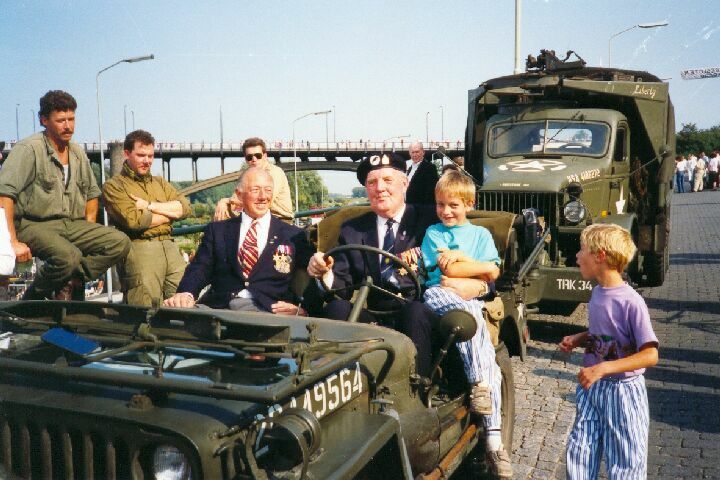 The riverside (Waalkade) at Nijmegen with army vehicles from World War Two of the "Keep them Rolling" organization. Sunday, 17th September 1989, 16.00 hrs. The Battle field tour at the Derde Baan near Groesbeek. In the Dukw, Dennis Sear with his bag of acid drop. Monday, 18th September 1989, 16.00 hrs.